It’s Monday and I don’t want to leave you without any ideas for your dinner today. Here’s the artichokes with peas and carrots recipe I cooked yesterday. The quickest and easiest version possible! How to make: Saute onions for 3-4 minutes, add garlic (optional) and saute couple more minutes. Add artichokes, peas and carrots. Add water to barely, BARELY cover the veggies. Don’t put too much water. Probably a cup of water is enough. Sprinkle salt & pepper, and add dill & lemon. Let the food cook in low heat for about half an hour. Ready! Notes and tips: Leave the dill out if you have kids who don’t like seeing the green things in the food. I like putting just a little more water and thicken it by adding 1 tablespoon flour melted in a little water. This is a nice, high fiber recipe. For a less quick version you can of course buy fresh artichokes but that’s too much work for me and 4 out of 5 times the artichokes in the market are way too hard. 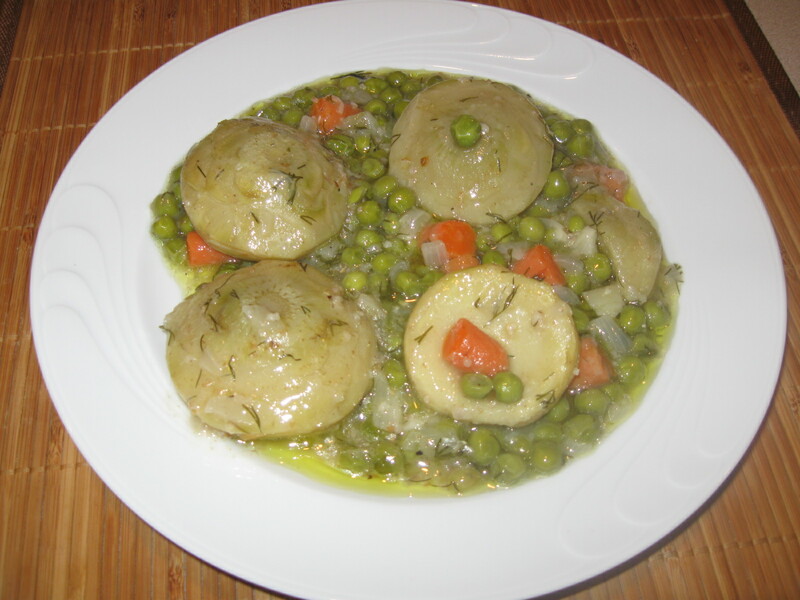 My favorite artichokes recipe is ‘a la polita’, with potatoes and carrots but today I wanted to raise the fiber content with peas, plus I didn’t have potatoes. It’ll be coming, though. I cook it quite often.